More than just a cycling pack, Detours’ Sienna 30 will take you on scores of miles by bike and thousands of miles by air. With two mesh drink holders, four zippered pockets and one mesh pocket in front, this pack has cargo room. I was able to put my passport within easy reach as well as hold magazines and bottled water for my flight to Italy. In the states, riding along the bike path on my bike was a safer adventure with the Detours’ pack; I kept hydrated with the water bladder compartment and my air pump tucked nicely inside. My spare inner tube and patch kit were safely stowed in interior pockets. The Sienna 30 is designed for cyclists with features like the ventilated back, arched lightweight frame, water hydration pocket, detachable mesh helmet holder and protective rain cover make this an all-season pack for winter and summer travel, on and off the trail. As smog continues to rise in various cities, more and more of us are going “green.” The Detours’ Sienna 30 is ideal for the working commuter who is conscientious about the environment and wishes to travel by bike. The large compartment of the pack conveniently holds a change of clothes and the ventilated back panel keeps you dry on your morning ride to the office. The mesh drink pockets off to the side also have elastic bands to accommodate a small thermos full of coffee to kick start your day. Storing your helmet is easy while you are at work; in a zippered pocket at the base of pack. The Sienna 30 comes with a detachable soft mesh holder which hooks into two front facing loops to house your helmet. Speaking of going green, I chose the pea green color for the Sienna 30. For $80.00, the pack also comes in blue, black and sky blue. It has been more than 100 degrees in Redding, CA where I’m training for a bike event on Mount Shasta. I appreciated the AirGo ventilated mesh enclosing the arch design of the pack frame. 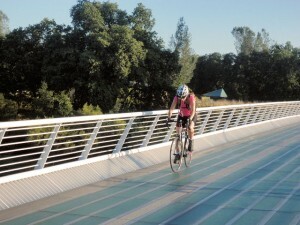 It is a welcome relief along the steep trails surrounding the Sacramento River for its ability to wick away sweat. The adjustable straps at the hips and chest took pressure off the back. And as I kicked into full gear and raced along the straightaways, the padded shoulder straps eased the pressure. My green pack gave me a turtle like feel as I leaned forward for greater speeds. 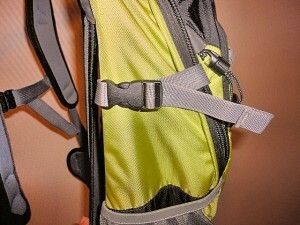 I liked the bright orange pull straps in contrast to the pea green colored pack. It was easy to find them when I needed to quickly get to the granola. The larger compartments come with large finger pulls and the smaller pockets have a smaller pull grip. 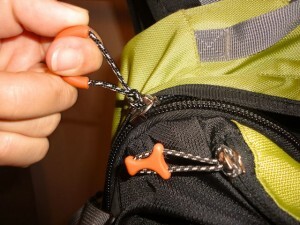 The finger pulls are attached by removable cords, which actually came loose a few times. It would be nice to have the pull grips permanently fastened, as they may become lost on a ride. We enjoyed packing a lunch in the Sienna 30 for a warm hike along the McCloud River. I was thankful for the additional H20 compartment to retain my Hydropak water bladder, there is also a bite valve strap sewn in at the upper portion of pack. You will also have to use your existing water bladder, as Detours’ does not provide a water bladder with this pack. The additional H20 compartment kept me well hydrated and out of the peach tea so I could save it for lunch. The ventilated back was a welcome addition on the hike as well, and the light weight durable frame kept the weight of the heavy roast beef sandwiches and pound cake off my shoulders. The Sienna 30 went along for some worldwide travel when I was in Italy in July. On the airplane, the pack stored nicely under the seat in front of me, and also tucked away well in the storage compartments overhead. Magazines were kept in the front mesh pocket, and I liked how I was able to see through the mesh to determine what publication would take me away from the 11 hour travel time. A rain storm hit the city while searching for Michelangelo’s, The David, in Florence. While my fashionable “up do” was not ready for the down pour, the Sienna 30 was. At the base of the pack, there is a small Velcro pocket that contains a yellow waterproof rain cover. The cover was a cinch to place over the pack, secured with a simple Velcro strap that makes getting out of the rain a breeze! Water was also averted from the zippered pockets, keeping my important passport documents nice and dry. 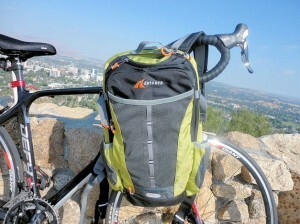 The Sienna 30 became a staple in my outdoor traveling gear this summer, and I continue to use it to tote around town and train on my Giant bike. Recently we reviewed Detours’ Guppy seat bag, and we found the Sienna 30 to be a more spacious version of the same quality construction. If you are trekking on your mountain bike or racing to the grind stone, Sienna 30 will get you there; well prepared and dry!